Here’s a quiz. How can you visit some of the best royal palaces in Europe with no crowds? What about some of the best art collections? Or famous restaurants? Answer – head for Denmark in February. It’s a counter-intuitive strategy and not one that is endorsed by many travel writers. The perceived wisdom is that Denmark in February is cold, gray and many of the sights are closed. But we were tired of fighting our fellow Brits at Heathrow and on the slopes and beaches, as we have every year, and headed instead to the place on no one's list - Denmark. Sure it was cold and some of the sights we really wanted to see, such as the Open Air Museum and Karen Blixen’s house, were closed, but even more were open. 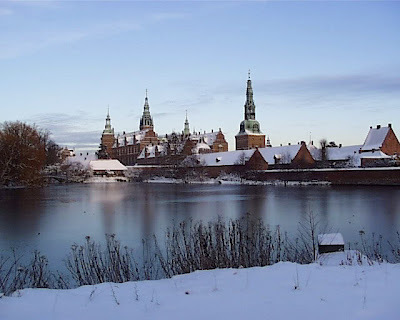 Some of the finest sites, such as the fairy-tale Frederiksborg Castle, seemed virtually deserted. After arriving at modern, efficient Copenhagen Airport, we headed for Brede, a small community north of Copenhagen containing an 86 acre Open-Air Museum with farmhouses and dwellings from all over Denmark and Brede Works, a preserved mill and factory. The museum and factory are closed for the winter but we were staying with a friend who lives in one of the historic factory workers cottages, – a magical place straight out of the time of Hans Christian Andersen. We hiked in the snow all around the beautiful woodland retreat and we highly recommend taking the 30 minute train to Brede, considered one of the loveliest train rides in Denmark – when the museum is open which is from April to September. In the late afternoon we took a short drive to Allerod and Ninas Natur Café – also closed for the winter – but as we are friends of Nina and her husband, Hans, we had a sneak preview of the delicious food, lovely countryside and warm welcome that await visitors from May through September. We began the day at Frederiksborg Castle in Hillerod (22 miles NW of Copenhagen) which is both a former royal palace and the home of Denmark’s Museum of National History. This is an exquisite Renaissance castle, full of romance, and the national history collection is vast and fascinating. As palaces go, Frederiksborg is five star, with the added benefit of being open every day of the year. Lunch across the street from the castle at the Slotskroen (a tavern since 1795) included lots of herring, open faced Danish sandwiches and plenty of beer and acquavit which set us up well for the afternoon. After lunch, we headed for Helsingor and the Kronborg Castle, made famous by Shakespeare in Hamlet under the name of Elsinore Castle. Positioned dramatically overlooking the Oresund (the straits between Denmark and Sweden), this fortress is as mighty and foreboding as Frederiksborg is beautiful. Our last stop was at Louisiana – not the American state – rather, a fabulously sited modern art museum overlooking Oresund with unusual architecture, a sculpture park and a blockbuster collection: Picasso, Giacometti, Pollock, Calder and so much more. I wouldn’t call the place empty but it certainly wasn’t crowded and for fans of modern art, I would call it unmissable. Such is the compact scale and vast cultural richness of Copenhagen that we were able to visit three remarkable museums and enjoy an excellent lunch and still make it back to Brede for a fine dinner. While we were doing all of that, our 12 year old daughter was off visiting the Experimentarium, a museum within the old Tuborg brewery bottling hall designed to make science accessible to the masses. As Eloise has promised to write a post about her experience, I will say no more about it now. Anyway, following the No Crowds rule of bypassing major museums in favour of smaller more interesting ones, we began our day at the Hirschsprung Sammlung. Housed in a romantic neoclassical pavilion in a lovely park, this fine collection of 19th century Danish art was donated to the state by the German-Jewish tobacco magnate Heinrich Hirschsprung whose giant portrait greets you as you come in the door. As I’m partial to German-Jewish tobacco magnates, I felt we were off to a great start. The collection of paintings from Denmark’s Golden Age (1800-1850) are particularly inspiring. Next up was the David Collection. Housed in an early 19th building that was once occupied by the Museum’s founder, Christian Ludvig David, the museum is really three collections: 18th century art displayed in period interiors; Danish early modern art and a world-class collection of Islamic Art. Similar to the Wallace Collection in London and the Jacquemart Andre, this museum provides the opportunity to see a highly individualistic collection in the collector's home. Lunch took place at the Slotskaelderen (near the Christiansborg), famous for its open faced sandwiches, the smorrebrod. Open since 1797 and run by the same family since 1910, this place is old fashioned, authentic and big fun. The smorrebrod, as you would expect, were delicious. After lunch, we headed across the street to Thorvaldsens Museum that houses the work, possessions and last resting place of Denmark’s most famous sculptor, Bertel Thorvaldsen (1770- 1844). Dinner was back in Brede at the now rather elegant Brede Spieshus, which was once the cafeteria for the factory workers. The restaurant sits picturesquely overlooking a small lake and the food is good. Social experiment in self-government? Drug haven for drop-outs? The longest running anarchist commune in Europe? We had heard so much about the Free City of Christiania, an 86 acre area of Copenhagen with roughly 1,000 residents who have been operating autonomously since 1971, that we just had to see it. The problem was, we saw it in the middle of a blizzard which made walking around the community an abbreviated affair. Highlights of our time in Christiania included husband and daughter shooting pool in a café where the mild scent of pot wafted through the air. We visited the Loppe building with its impressive grafitti, famous music venue and much admired restaurant, the Spiselopen. Being capitalists, we also bought a distinctive Christiania sweatshirt in bright red with yellow dots to support the anarchist cause which I now wear all over London in the hope of meeting Danes. In all, it was a fun and interesting place. They have their own currency and are doing their own thing and the fact that the government hasn’t shut them down shows that their controversial social experiment still claims sufficient support from the people. We say - Right on, Christiania. As it had snowed all the previous day and most of the night, I figured we would never get out of Denmark. With my UK hat on, I expected road chaos and airport delays. Instead, we woke to find the roads plowed and clear and our airline running to schedule. What a great country! As our plane took off over snow-covered Denmark, I thought, As soon as we can, we’ll be back. The friends that we stayed with highly recommend the Guldsmeden Hotel group who have several properties in Copenhagen at varying price points. All Guldsmeden properties are distinctive, sustainable and owner operated.